Celosia is your furry flower friend! This unique flower is sure to liven up any design with its bright colors and velvety texture. It’s super dense, making it a good filler. For those of you looking to vamp it up, the Agonis can add a moody touch to your fall wedding flowers. It comes in bunches of maroon and green and makes for a great filler in wedding bouquets. Most people have seen the standard size white wedding flower calla lily, but have you seen all of the other colors before? From pink to orange to purple, there is so much variety. If you love the pink ombre trend, look no further. These long fragrant stems come in many colors, but those that really stand out are the ones that fade from orange to pink! There are over three hundred types of dahlias that come in all shapes and sizes that are available from summer to fall. With dinner plate dahlias, cactus dahlias, and ball dahlias, there is something for everyone. Big and bright just like its namesake, sunflowers add a seasonal touch to summer or even a fall arrangement. Sunflower act as an eye-catching focal point in many beautiful wedding bouquets. Anemones reveal their bright petals during mid-spring, so keep your eye out for them at your local farmers’ market. These flowers make any wedding bouquet or centerpiece you put them in a little hipper. Add a whimsical touch to any style with a bunch of cosmos. If you want to create a moodier feel with your flowers, find some chocolate cosmos to add to the mix (and yes, they actually smell like chocolate!). Freesia is a versatile flower that you can use a filler or to define the focal point of any design. The bell-shaped petals add a subtle texture to bouquets. Peonies are a wedding favorite for their lush and aromatic beauty. 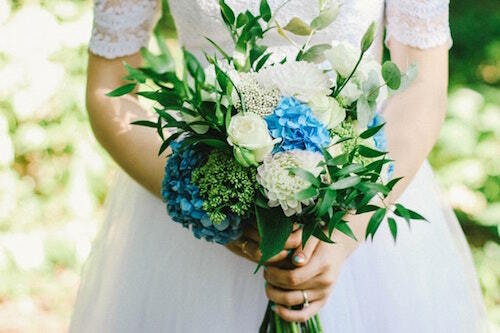 You can buy these most popular wedding flowers during spring when they at their biggest and brightest, and you’ll be sure to have a romantic bouquet. These delicate flowers will wow you with their playful butterfly-like petals and various hues. If you are looking to add a fragrant scent to your bouquet, this is a great pick. Sweet and delicate, these flowers add soft touches to any bouquet. They are not all sweet though. Keep these flowers away from pets and children, as they can be extremely poisonous! Also, a favorite in Dutch Masters’ paintings, daffodils add just a touch of spring to arrangements in the cool winter months. They are sure to give your bridal bouquet a classic garden feel. Tulips have truly stood the test of time in romantic and lush bouquets. They can be seen in Dutch Masters’ paintings and have long been a symbol of beauty. Narcissus paper white flowers consist of small white blooms atop a green stem. These flowers can be great to use for pops of white or to achieve an all-over neutral effect in a larger bouquet. Undoubtedly, flowers play such a major role in weddings. By choosing the right ones, you can make a significant difference in the atmosphere you want to create for the overall wedding event.